"Cevaytis – breeding FOR the Beagle"
To breed Beagles means for me, not only to maintain the qualities of my dogs such as health, good temper and an appearance in accordance with the FCI-standard, but also to try to improve those qualities as far as possible with each new generation. For this reason, it is essential for me to keep looking worldwide for suitable partners for my dogs or even new breeding dogs. Each mating is prepared with great care and usually many years in advance. As a breeder you have to learn constantly about genetic diseases and the according DNA tests - this information has also an influence on my breeding programme. My puppies are raised with love and knowledge and the closest contact with people and nature. 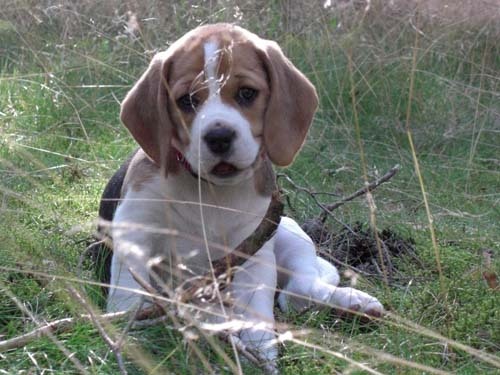 The pups are made familiar with everyday situations: the Beagle-kids grow up with us in the house, as an equal part of the family. They have almost permanent access to the garden, which they can explore and are the first to welcome visitors. Trips to the town shall ensure that the puppies get used to the noisy traffic and the car and learn to walk on a lead. From the beginning of the third week the puppies are also additionally fed by me, which I also do to relieve their mother. After each meal and several times during the night the puppies are brought outside, so they are house-trained from the beginning on - an important support for the future dog owners. The pups are wormed regularly and in the 6th and 9th week they are vaccinated. All puppies are micro-chipped as well as checked and tattooed by the Kennel club. Visitors are always welcome by prior appointment. 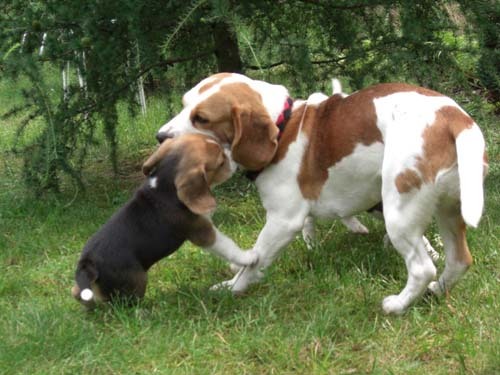 The Beagle is a very excellent dog for beginners, but only if they get help from a (good) dog school. Since I expect that your Beagle pup becomes an equal member of your family, it is obvious that keeping him in a kennel or permanent leaving at home alone do not meet these requirements. I hope to stay in touch with the dogs I bred, so I would like to remain your contact person and try to help you always with advice and assistance. If you are interested in a healthy and well-socialised Cevaytis Beagle and want to get to know our pack, please feel free to contact me by e-mail or phone so we can agree on a soon meeting.